In May 2005, The Texas Press Association will celebrate their 125th Anniversary. To commemorate the date permanently, the TPA (headquartered in Austin) commissioned Houston sculptor Bridgette Mongeon to design a statue depicting an early newsboy hawking his papers. If everything goes according to plan the scupture will be permanently installed on the Capitol grounds this May. In a simple newspaper story, the information might've ended with the paragraph above; but being the Internet age, Ms. Mongeon, who also writes and illustrates children's books, took the project a bit further. She decided to share the entire process from start to finish, including her thought process, her research and even her inspiration. 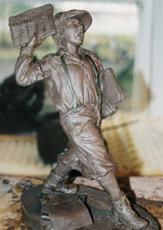 Her website's page on the newsboy statue http://www.creativesculpture.com/texaspress.html is a lavishly illustrated artist's journal, with close-ups, vintage photos of newsboys and the entire process of creating the statue from armature to photographing the model to the final casting. Each page includes teacher and student study questions, discussions and suggested further reading. Ms. Mongeon, who admits she likes to saturate herself with the subject at hand, may be guilty of understatement. Her site is an education on newsboys - a graduate school of papermongers. You can't help but be drawn in. The twin themes of statues and newsboys sail off on their own paths but always return to blend seamlessly together into the single project. On top of that, you share in Ms. Mongeon's various hunts - for model, costume, history and information. There's information you never thought existed - like the year the very first newsboy was hired (1833) and even his his name (Barney Flaherty). There are discourses on knickers vs. long pants, types of suspenders, buttons and whether of not to include coins in the statue's pockets. The poignant stories of real-life newsboys are included via another web source. Her model for the work was the eleven-year-old son of a family friend. Equiped with the appropriate name of "Dusty," this young man will someday be able to take his grandchildren to see him as he once was "back in "04" - impersonating a nearly-forgotten part of our cultural heritage. Dusty could actually be standing in for his own grandfather - who was a newsboy in his youth. While the event is the Anniversary of the TPA - the statue also belatedly honors the newsboys (and sometimes newsgirls) that supported families, simply made pocket money or perhaps even learned to read by delivering the news of their day.